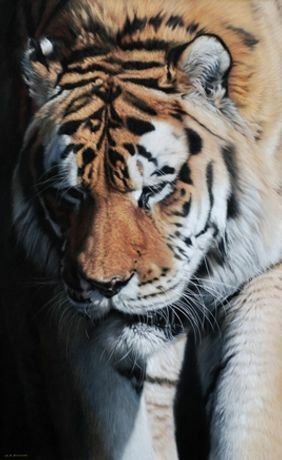 Jonathan Cooper Park Walk Gallery is pleased to announce âEye to Eye,'an exhibition of large-scale pastel paintings of Big Cats by Gary Stinton. Against simple black backgrounds in his signature medium, soft pastels, Stinton's bold close-up portraits of tigers, leopards and lions capture the beauty and ferocity of these powerful animals. âWhen portraying animals we can only hope to capture something of an animal's essence while attempting to make our pictures live. Life is the most important element in my work. '(Gary Stinton, 2012) The intense and rich quality of his work is enhanced by Stinton's choice of medium. By working in soft pastel without using a fixative, he creates a realistic impression of the fur. He applies the pastel onto museum board which he primes using artist's acrylic primer with marble dust. From an early age Stinton began observing and drawing animals. Over the years he has further developed a great respect for wildlife, and his passion for drawing animals and his admiration of them emerges through his portraits, which are full of personality, movement and life. Stinton's goal is to raise awareness about wildlife conservation, and has worked with numerous wildlife charities as Elephant Family, which is the UK's leading conservation charity for the endangered Asian elephant.